October 19, 2015 October 19, 2015 / Elizabeth T.
I’m back again with a fashion-related post today, and I’m so excited to share this black-and-white autumn look with you all since it’s finally feeling like fall in Los Angeles 😀 (though that actually means temperatures are still in the lower 80s)! Since it’s still warm in the afternoons, I opted for a darker pair of denim shorts. The shorter length makes this outfit a lot more functional since I don’t want to walk around sweating in jeans just yet. Likewise, the darker wash is more autumn appropriate since fall is ruled by a richer color palette. Underneath the kimono, I wore one of my favorite wardrobe staples, a loose fitting t-shirt, which can be half-tucked into shorts for an instantly chic look. I finished off the whole look with a wide-brimmed black wool hat, one of autumn’s most basic accessories, and my trusty black ankle booties, effectively completing the balance of white and black for this whole outfit. Similar Styles – rag & bone, Munro, G.H. Bass and Co.
Is it feeling like fall where you live? How are you all dressing for the cooler temperatures? Let me know in the comments! I’d love to hear from you! Love your outfit! I’m definitely dressing a bit more warmer than you are since its like 5 C where I am. Chunk scarves and sweaters :)! Thank you so much love 🙂 And aww it must be super cold in Toronto right now. Haha stay warm ❤ Can't wait to start wearing chunky scarves and sweaters too (though in LA that probably means not until late December or early January)! Love long throws like that! You look beautiful! Wow. Your outfit is beautiful. You look stunning on it. ! Thank you so much Rochelle! 🙂 You’re too sweet! Such a perfect fall look! 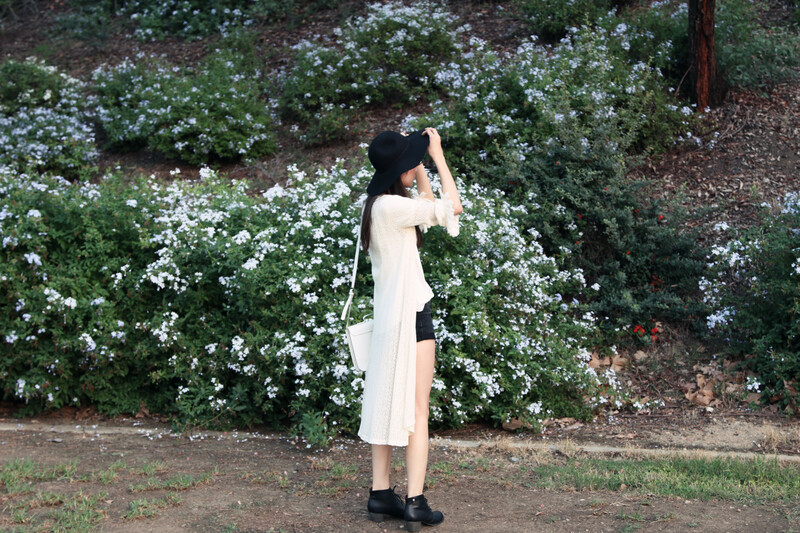 Love the beautiful long kimono on you! Thank you Maggie ❤ Black and white is perfect for the fall! Love the fun fringe details on the cardigan! Yes, the fringe detailing is what attracted me to it at first too ❤ 🙂 Thanks for stopping by love! That black wool hat of yours is so stylish. The same goes for the black booties and kimono. Lovely pictures with the reddish hue background. Yes, wool hats are perfect for the fall! I’ve been wanting to get a gray and maroon one too 🙂 Haha and the leaves are finally changing, so that’s what made the red hue so picturesque ❤ Thank you for stopping by Shirlyn! Your long cardigan is beautiful, and complements your outfit! Im a big fan of long throws, they are so comfy and stylish! 🙂 and I love how you pair the shorts and boots, its so cool! Me too Tiffany! I can’t wait until it gets cooler, so I can start wearing long coats and sweaters too 🙂 Thank you so much for stopping by! What a great outfit! That long cardigan is beyond cool! Thank you Carine! 🙂 Long cardigans are such a fall fave! Need a cardigan like that ASAP! Love it! Aww thank you so much love ❤ You're so sweet! Beautiful look, love the pics! Love your hat! Really brings a chic touch! So beautiful! love this ootd look of yours!!!! Thank you Tiff! 🙂 And yes the kimono and hat can work for both the spring and fall ❤ It's one of my current faves to wear right now! Thank you so much Chayanika! ❤ 🙂 You're too sweet! Beautiful Outfit. You look very sweet.